The tree of the future! 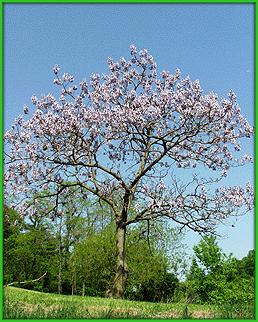 Paulownia tomentosa originates from China where historical records describe its medicinal, ornamental, and timber uses as early as the third century B.C. It was cultivated centuries ago in Japan where it is valued in many traditions. It was first imported to Europe in the 1830’s by the Dutch East India Company and then brought to North America a few years later. Paulownia tomentosa, also known as Princess tree, Royal paulownia or Empress tree, is a small to medium sized tree that may reach 10-20 meters in height. The bark is rough, gray-brown, and interlaced with shiny, smooth areas. Stems are olive-brown to dark brown, hairy and markedly flattened at the nodes (where stems and branches meet). Leaves are large, broadly oval to heart-shaped, or sometimes shallowly three-lobed, and noticeably hairy on the lower leaf surfaces. They are arranged in pairs along the stem. Pale violet flowers open in the spring and are conspicuous upright clusters. The fruit is a dry brown capsule with four compartments that may contain several thousand tiny winged seeds. Capsules mature in autumn when they open to release the seeds and then remain attached all winter, providing a handy identification aid. 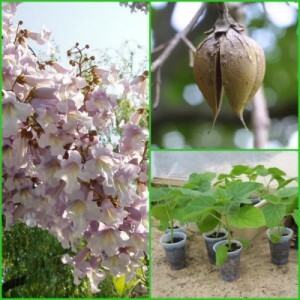 Plantations of Paulownia tomentosa can be established using many types of planting stock, including seeds, bareroot seedlings, containerized seedlings, and root cuttings. 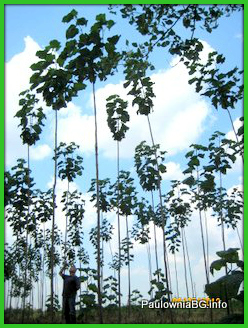 Root cuttings are preferred for vegetative propagation of Paulownia in many parts of the world. Because they require minimal effort for storing, transporting, and planting, root cuttings may also provide a viable planting stock for plantation establishment.